Heat the oven (with the oven rack in the middle) to 375°. 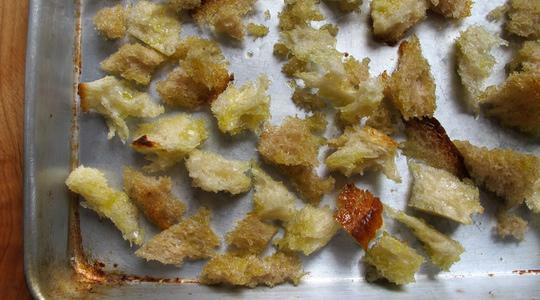 For the croutons, tear a piece of French bread into bite-size pieces to get about 2 cups worth. Place onto a sheet pan and drizzle with 2 tablespoons of the oil. Toss well. Bake until golden brown and crispy, 8 to 10 minutes. Meanwhile, in a food processor, combine the Parmesan, garlic, buttermilk, salt, pepper (about 6 turns on pepper mill), and the remaining 1 tablespoon of the oil. Pulse several times until blended and creamy. Put the arugula into a salad spinner. Wash and spin dry. Transfer to a salad bowl and toss with the dressing and croutons. Serve sprinkled with a little more Parmesan.